It is not often that I stumble upon a book with a title such as Dolph the Unicorn Killer & Other Stories. It isn’t often that the covers of such books feature a man built like a bull, holding the freshly severed head of a unicorn in one hand and a sword in the other. It definitely stood out and immediately piqued my curiosity. Because why on earth would anybody kill unicorns? Martin Lastrapes, the author of this comical anthology, will bluntly lay it down for you. Of course, Dolph the Unicorn Killer isn’t the only story in this book and, despite being in the title, it is one of the last chapters. 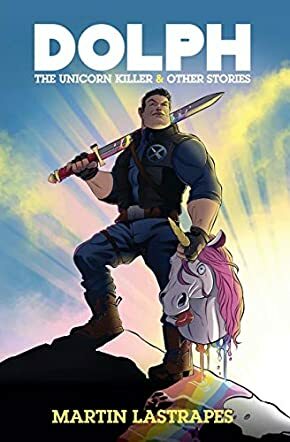 Dolph the Unicorn Killer & Other Stories can be interpreted as both a satire and a bit of an homage to Sin City and supernatural fiction anthologies. Yet be warned, there are vampires, profanity, and a whole lot of laughter. I don’t think I’ve ever read anything like Dolph the Unicorn Killer& Other Stories in this sub genre of science fiction and fantasy, at least nothing as profoundly imaginative. Lastrapes does not let the conventional boundaries of fiction writing tie him down. The development of each story is thoughtful and humorous. The plots are ingenious. Figuratively speaking, Lastrapes is a madman with a pen. His word usage is tastefully vulgar and necessary, and although the violence and profanity may deter some people from reading, they will only end up sorely regretting not taking a glimpse at the whimsical tales within the pages of this book.